WES ID REQUIRED FOR ENTRY. NO TICKETS. COME EARLY TO ENSURE YOUR SPOT. S’natra: Rising Harlem based hip hop artist S’natra lays his smooth melodic vocals over heavily jazz-influenced beats. Through collaboration with Ivan Jackson of Brasstracks, the Grammy nominated production duo behind Chance the Rapper’s “No Problem,” as well as with JNTHN STEIN, S’natra effortlessly crosses between styles and genres to produce a body of work that strikes the perfect balance between something borrowed and something new. He has performed with several national touring acts, including GRiZ, Talib Kweli, Gramatik, and Lido. S’natra’s influences outside of the hip hop genre and his brass accompaniment give him a unique sound and allow him to play alongside a variety of styles. Lance Skiiiwalker: A relatively new addition to the TDE family, Chicago native Lance Skiiiwalker followed up appearances on previous projects by Schoolboy Q, Jay Rock, and Kendrick Lamar with the release of his debut album, Introverted Intuition, last fall. The project features production by Stefan Ponce (Grammy nominated for his work on Childish Gambino’s Before the Internet), THEMpeople (frequent collaborator with other members of the Chicago hip hop scene including Chance the Rapper, Vic Mensa, Noname, and Mick Jenkins), and TDE co-president Dave Free. Skiiiwalker’s vocal stylings offer a unique counterpart to the primarily rap-centered TDE family. 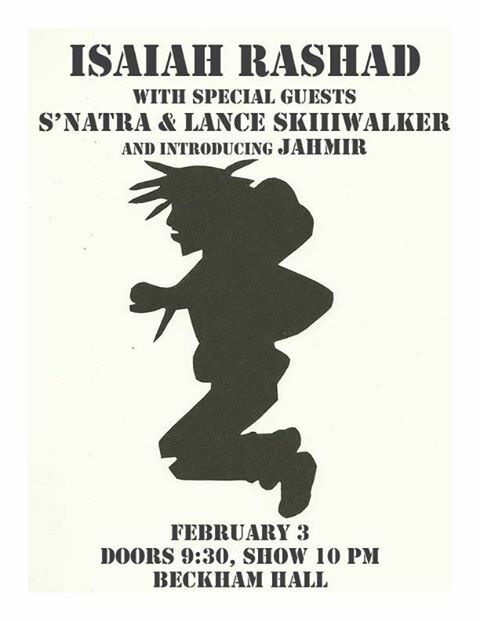 Skiiiwalker has been supporting Rashad on his Lil Sunny Tour dates, and we are hyped to have him join us too. Born and raised in Brooklyn, Jahmir brings New York to every lyric he spins. His music, self- produced and also aided by fellow New York producer Adobe, takes you from the Caribbean icees on 125th St to his experience with tense police encounters in his own neighborhood. Everything he spits, whether playful or reflective, comes from a place of urgency. A young voice coming fresh faced into the music industry, expect an energized and tight performance complete with a backing band. Posted by wilk in Events, General on February 2, 2017 at 4:33 PM.